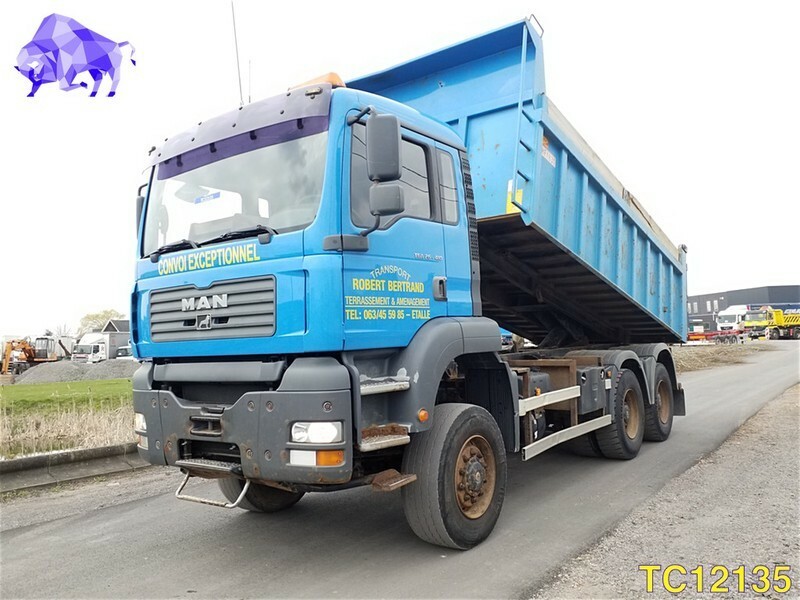 The list of MAN TGA tipper offered for sale in our catalog is constantly increased. Look at the technical data of the unit. This piece of special equipment was produced in 2003. Gross Vehicle Weight: 26000 kg. Engine/driveline: Euro 3, gearbox: manual, transmission: Schaltgetriebe. Wheel formula and suspension type: suspension: spring, front axle suspension, 6x6, steering axles, wheel base: 4200 mm, brakes: drum, ABS, front tires: 385/65 R22.5, 5%, rear tires: Achse 1: 315/80 R22.5, 15% / Achse 2: 315/80 R22.5, 15%, dual wheels. Cab comforts include cab type: day cab, sunvisor, power windows, electric mirrors, central lock, air conditioner, cruise control, radio, CD, fridge. Body: loading length: 5350 mm, loading width: 2300 mm, loading height: 1250 mm, tool box. The payload is 12280 kg. Exterior measurements: length – 8150, width – 2500, height – 3600. The unit’s location is in Belgium.